The MNNRD is offering a $500 scholarship to an outstanding student in the district. To apply for the scholarship, students may be; a graduating high school senior, currently attending college or vocational school, or a non-traditional student acquiring additional education. Applicants must be a resident in the MNNRD. Students applying for the scholarship must be pursuing a degree in agriculture, natural resources, or wildlife studies. Scholarship applications will be ranked based on commitment to furthering education, academic achievement, leadership abilities, extra-curricular activities, and community involvement. The scholarship can only be awarded once per applicant. Applications should be accompanied by a copy of the most recent transcript, a copy of ACT scores and a sealed letter of recommendation. Outdoor Family Fun Day is an annual Niobrara NSR celebration of outdoor adventure. Bring the kids to explore a variety of hands-on activities, include canoeing, birding, making "fossils," eating marshmallows, and much more. Canoe rides--led by experts--offer a safe, fun introduction to paddling one of the best canoeing rivers in the country. Arrive early to reserve your spot! Discover the joy and beauty of birds while gaining tips on using binoculars. Celebrate the area's rich fossil heritage while making your own fossil impression to take home. Lunch is provided--just cook your own hot dog and marshmallow over an open fire! More activities will be added as the event nears. All activities are free of charge. Smith Falls State Park requires a $5/vehicle parking fee or a Nebraska Game and Parks Commission annual pass. Smith Falls State Park is located 19 miles east of Valentine, Nebraska via Highway 12. The Niobrara NSR is pleased to offer this event in partnership with the Niobrara Council, the Nebraska Game and Parks Commission, the Northern Prairie Lands Trust, the Natural Resources Conservation Service, the Nebraska Forest Service, the Nebraska Master Naturalists, and many volunteers. The Nebraska Youth Range Camp consists of a dynamic curriculum that appeals to students with a wide array of interests including, but not limited to, rangeland management, conservation, ecology, animal science, and wildlife. With nearly 50 years to perfect and evolve this curriculum, every student, no matter what prior experience they have, will learn substantial information that will help them become more aware of Nebraska’s most prevalent land use. 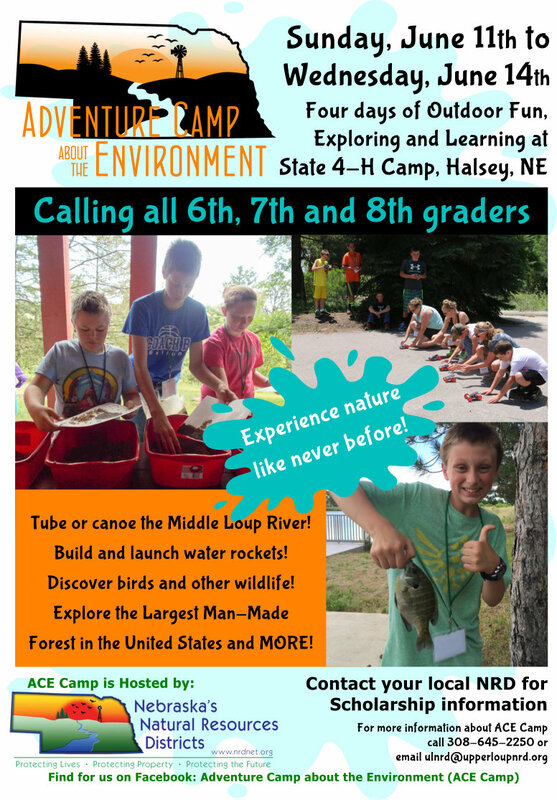 Nebraska’s NRDs host the annual Natural Resources Camp called "Adventure Camp about the Environment!" (ACE). ACE is open to 6th-8th graders who have completed 6th, 7th, or 8th grade and want to learn more about natural resources and have an adventure at camp. The areas campers will learn more about include: Aquatics, Forestry, Range and Grassland, Wildlife, Soils and Land. Campers will experience hands-on activities with a variety of speakers from across the state in each of the six areas, and also get a chance to explore possible careers in natural resources. ACE also includes adventure and activities for campers such as a zip-line, tanking and tubing, a campfire and many other games! ACE will be held June 11-14, 2017 at the State 4-H Center near Halsey. The cost of the camp is $190.00 per camper and will include meals, lodging and activities. For more information and registration forms, please contact Erika Hill at ehill@nrdnet.org or 402-471-7672 or email ulnrd@upperloupnrd.org or call 308-645-2250.
to Cherry County students to provide opportunities and financial assistance for them to successfully pursue their educational goals. scholarships to two (2) outstanding students pursuing careers in range management or range science. The Nebraska Envirothon is a competition designed for high school students (9-12th grades) to test their knowledge about the environment. Five-member teams compete on the regional level in seven areas of environmental studies: soil, aquatics, forestry, policy, wildlife, range, environmental policy and current issues. What makes the Envirothon different from other extra-curricular activities students already participate in? The Nebraska Envirothon competition gives your students the chance to take what they have learned in the classroom and apply it to life. Students are given the chance to interact with resource professionals who use the knowledge they gained in high school and college every day in their career. The Envirothon shows students the link between academics and the business world. For more information visit this website . trees have been planted since 2006. In 2016, there was also a community tree planting at the Valentine City Park. Thank you to everyone for conservation efforts throughout the years. The MNNRD partners with the Niobrara Council each summer to provide educational summer day camps for youth throughout the area. They also help to offer After-school Nature Clubs. For more information and dates please contact Wendy Murphy at (402)-376-2793.
hosted by the Niobrara Valley Outdoor Education Partnership. Over 100 school children from a four county participate at Nature Fest this year.